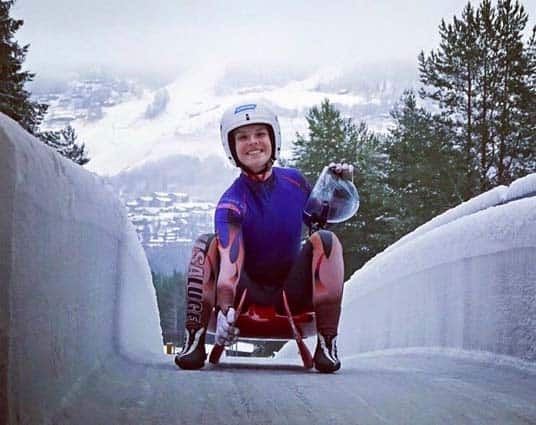 Killington Mountain School Luge athlete Grace Weinberg is back at school after a busy competition season both abroad and in Lake Placid. Weinberg, a senior from Pittsfield, was part of a four-person relay team to take fourth place at this winter’s Junior World Championships in Lillehammer, Norway. Additionally, Grace had a top-ten individual Junior World Cup finish along with a 12th place at Junior Worlds, and a third place result in the North American Pacific Championship. Her final competition of the season was Junior Nationals on her home track in Lake Placid two weekends ago. On a track that was beat up from a great deal of brake usage by bobsled athletes, Weinberg said she was happy to “defend [her] second place spot for the third year in a row” bringing home three silver medals.